The Scioto County Fair opens August 6. The first Scioto County Fair was held in 1828. The next fair runs Aug. 6-11 at the Scioto County Fairgrounds, 1193 Fairground Rd., Lucasville. Preparations for the latest edition of the summer festival are already well underway, said Robert Seaman, a past president of the fair board and currently board secretary and treasurer. Seaman actually has been with the fair for over 20 years. “It’s always rewarding when you get a nice compliment on the condition of the fairgrounds and maybe the 4-H show,” Seaman said explaining his long association with the fair. While Seaman is a big supporter of 4-H, he mentioned the annual circus show as one of the highlights of the fair for him. This year, Seaman said the Continental Circus will put on two shows 1 p.m. and 8 p.m., Aug.9. As with all the other grandstand shows, admission to the circus is included in the price of fair admission. That admission is $10 for all persons two years of age and older. Senior Citizens age 60 or older can get into the fair for $3 each Friday, Aug. 10. All profits go back into the upkeep and maintenance of the fairgrounds. On Aug. 6, the grandstand entertainment kicks off with bull riding and barrel riding at 8 p.m. The first of two Carnival of Thrills Demolition Derbies bangs its way into the grandstand field 8 p.m. Aug. 7. On Aug. 8 the first of two country music concerts features Parmalee playing for the grandstand at 8 p.m.
Perhaps the biggest act of the fair takes the stage Friday, Aug. 10. Tracy Lawrence has sold over 13 million albums and placed 22 songs in the Billboard Top 10. His last number one single was 2007’s “Find Out Who Your Friends Are,” according to Wikipedia. His most recent CD was last year’s “Good Ole Days.” Lawrence also hosts a nationally syndicated country music radio show. The grandstand entertainment wraps up with the second demolition derby 8 p.m. Aug. 11. While he talked about the grandstand entertainment, Seaman went out of his way to emphasize the involvement of the 4-H organization with the fair. “We’re large supporters of 4-H,” he said. Seaman added while 4-H may be fading in popularity in some locales, that doesn’t seem to be the case in Scioto County. “We have a very strong 4-H program,” he continued, adding 4-H isn’t just agriculture but includes arts and photography among many other programs. This year’s fair will feature the usual 4-H animal displays with critters ranging from Guinea pigs to cattle and everything in between. “You’ve got some really good kids in 4-H, some of the best you’ve ever met,” Seaman concluded. The usual carnival rides also will be available free for the price of admission. 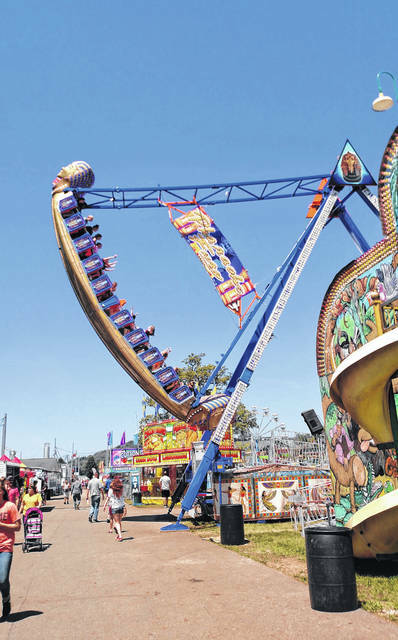 Except for short breaks in the afternoons, rides should be available whenever the fair is open. Seaman did not have attendance figures for recent years. He did admit attendance at the fair has been decreasing. He noted the busiest day is always Saturday. Parking is always free. The fairground office will be open noon to 4 p.m. beginning Aug.1 offering discount and good-any-time fair tickets. Call 740-259-2726.
https://www.portsmouth-dailytimes.com/wp-content/uploads/sites/28/2018/07/web1_FAIR17_ne2018717164718133.jpgThe Scioto County Fair opens August 6.